I went to my LYS the other day with definite plans to ONLY look for handles for the Berroco suede knitting tote that I am making (photos of that soon). I have a TON of yarn and I really don't need any more. I have way too many projects on the needles and don't need to start anything new. All was going well, I walked past the wall of Cascade 220 in wonderful colors and ignored it, past the cotton, past the cashmere, past everything. I was feeling good. I got to the rack of handles and unfortunately they didn't have what I needed. Oh well, that's OK. I'm not anywhere close to needing them yet anyway. I was on my way out - feet from the door - when I saw it. A gorgeous scarf in process on the table near the door. 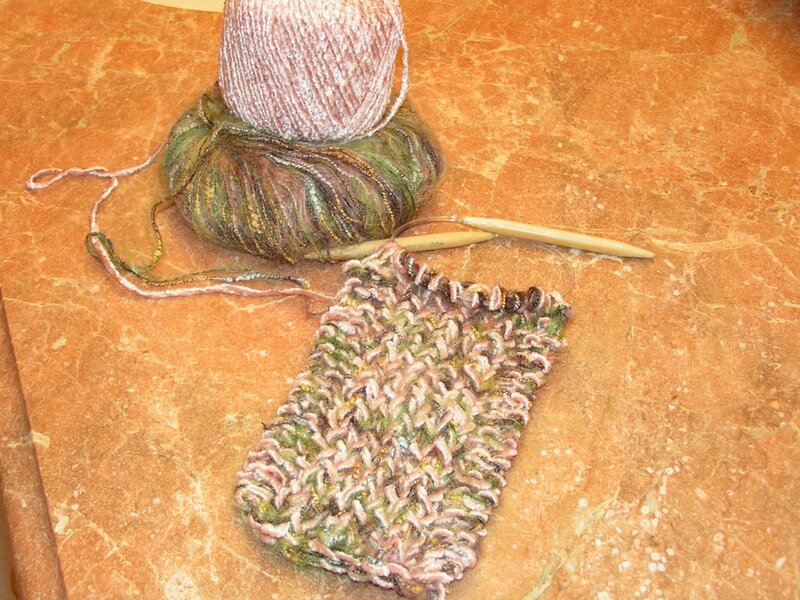 It was a combination of the oh so soft Touch Me yarn and some mohair. I don't even like mohair (what is mohair anyway?) But it was simple. It was elegant. It was oh so beautiful. It called to me. It sang to me. I had to have it. Really, truly, I tried to resist but it was of no use. Next thing I knew I was leaving the store with yarn for not one but TWO of these wonderful scarves. I've started the one on the left in a very soft pink Touch Me and a multicolored green mohair. The photo doesn't really do it justice. Why is it that yarn is so appealing? Why is it that we suspend all logic and restraint when it calls to us? I've heard the fables of sirens in the sea that would sing to sailors and enchant them. They would follow the sounds until their ships crash upon the rocks. I think yarn is like that - it sings to us, we can not resist and we follow it - right in to bankruptcy! Next time I will wear ear plugs! i love the colour combinations! I fully support your "Siren Theory". I shall try the earplugs as well. :) However, when such beautiful soft yarn as that calls to you, how is one supposed to resist? 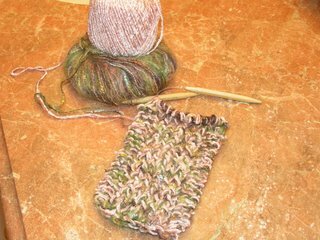 I love the yarn by the way..the scarf looks scrumptious....I am having trouble finding handles for my bag..but heck I am only have way done..you emailed me a bag a bit ago..but i couldnt find the pattern do you know where it is? Thanks for being such a GREAT pal! We are going to Ravinia tomorrow night (an outdoor concert venue in the suburbs of Chicago). 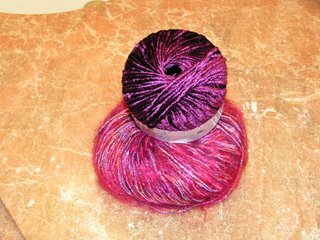 I plan on trying to get started on a felted bag with the Malabrigo I bought at stitches and the light up needles. I will let you know what I think.